In climate science, those who employ this rhetorical tactic attack individuals who ask probing scientific questions. The attacks indicate that they know how inadequate their science is. It often works because of a deliberate campaign to exploit basic sensitivities: fear the sky is falling, guilt about not protecting the environment, guilt about the damage already done, fear and embarrassment of showing ignorance. People who challenge the claims of the Intergovernmental Panel on Climate Change (IPCC) are often labeled “global warming skeptics”. Skeptics do not deny that warming occurred in modern times, but, sensibly, questioned the cause. The IPCC said it was due to human production of CO2. This is driven by a political agenda, not science, so any opposition is considered troublesome and requires silencing. It’s worrisome enough that the German government itself recently issued a brochure singling out, naming, and defaming German and American climate science skeptics. Today we have one of Germany’s most prestigious science associations actively backing adolescent-level attacks on skeptics who have decided not to take part in collective climate hysteria. Helmholtz Center’s Climate Service Center displays its ugly ideological side in defaming skeptics as deniers. Click here to view defamatory video. The above tweet comes from the Climate Service Center, which provides a link to an intolerant video called “The League of Deniers“, which was produced by Kickstarter.com. In summary the video portrays skeptics as “deniers”, claims that ”the public is misinformed” and that skeptics’ words are “human foolishness”. To help them understand why there are skeptics when it comes to climate science, below are some questions that us skeptics have been waiting 15 years to receive answers. Why has there been no global warming for 17 years? Why have 97% of the climate models failed to foresee this? Why has Antarctic sea ice been well above normal for more than 2 years? Why are northern hemispheric winters getting colder? What makes the present warm period any different from that of the Medieval warm period? If there is consensus on manmade climate change, then why is there so much controversy over it? Do you think that it’s not necessary to have skeptics in order for science to progress? Perhaps instead of wasting taxpayer resources on sophomorically defaming and ridiculing those who legitimately ask questions, the Helmholtz Center ought to focus on providing some clear answers for the above questions for once. The pseudo-scientific ramblings by their leaders have falsely warned of mass starvation, ecological collapse, agricultural collapse, overpopulation…all so that the masses would support their radical policies. Policies that would not voluntarily be supported by a majority of freedom-loving people. They are just as guilty as the person who cries “fire!” in a crowded theater when no fire exists. Except they threaten the lives of millions of people in the process. Like the Nazis, they advocate the supreme authority of the state (fascism), which in turn supports their scientific research to support their cause (in the 1930s, it was superiority of the white race). Dissenting scientific views are now jack-booted through tactics like pressuring scientific journals to not publish papers with which they disagree…even getting journal editors to resign. What has become of society, and science, when one of the core principles of the scientific method – the ability to question it – is met with “Nazi” totalitarian hostility? 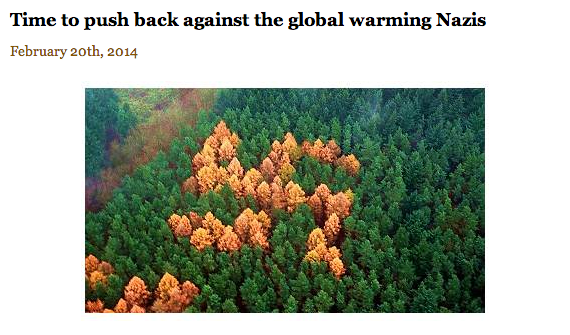 The inference ‘eco-fascism’ not too far from the truth at all. Climate Service Center (CSC) has removed “The League Of Deniers” video link from their webpage. However, their tweet endorsement still remains. Labeling People ‘Climate Change Deniers’ Merely Reveals the Attacker’s Ignorance | Watts Up With That? Nature’s ugly decision: ‘Deniers’ enters the scientific literature | Watts Up With That? Lord Leach of Fairford weighs in on Nature’s ‘denier’ gaffe | Watts Up With That? President Obama and his cabinet have laid down the gauntlet, by announcing that any government scientist who interferes with the White House political agenda will be purged. This makes it impossible for any scientist to act as a whistleblower, or even publish an honest paper. 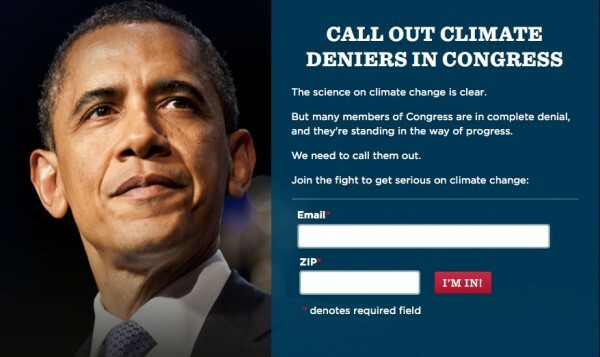 In 2009, Obama promised to de-politicize science. The way he de-politicized it, was by strong-arming all government scientists into reporting results which back Obama’s political agenda. Obama is openly dictating science from the White House. This approach was SOP in the Soviet Union and Nazi Germany, but a first for the US.